Maybe it was nuclear fire, a massive meteorite, the Zombie Flu outbreak, or some other end . . . what matters is that the Old World is gone, replaced by what we affectionately call the "wasteland." It's a dangerous place, and sometimes it seems like everything and everyone wants to kill you. But for those tough enough, smart enough, and lucky enough to survive, the rewards are worth it. 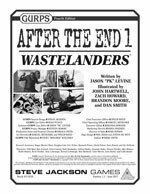 GURPS After the End has everything you need to adventure through the remains of a post-apocalyptic world. It streamlines GURPS to focus on this genre without losing the flexibility that makes the system great. Just answer a few questions about the apocalypse to create a unique setting. Then choose your templates, optional lenses, and gear and you've got the heroes. It couldn't be easier! Set whatever tone and power level fits your vision. Are the end times a cinematic setting of motorcycle-mounted madmen, a realistic struggle for sustenance, or something in between? Did the world end today, or does future-tech lurk buried beneath the sands? GURPS After the End supports it all, giving you the wasteland that you want. Whether the village elder saw Ragnarök with childhood eyes or the Old World is a near-forgotten fairy tale, this series lets you forge your own future as strange or savage as you dare. The wasteland may be tough and unforgiving, but those who master it can become legends. The destiny of the New World is in your hands! New issues of Pyramid come out every month, and many of them are centered on – or contain material of interest to – After the End gamers.